If you are someone who looks for information about oysters online and you have not found the work of Richard Rush yet, you've been missing out. With his new tongue-in-cheek approach on Facebook, information about oysters is accessible in a new, fun, and entertaining format. His most recent writings include "Child's Pet Oyster Escapes" and "Monster Oyster from Outer Space is a Proven Hoax". 'Like' his Facebook page to receive his information. As of today, he has 12 Likes. 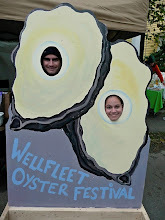 I'm willing to bet a dozen oysters that Oyster Information Newsletter will have triple digit 'Likes' soon. Once you've done your homework, try your luck with his free oyster exam. If you do well, you'll receive a Certificate of Achievement, suitable for framing. For those into crossword puzzles and oysters, Richard Rush designed an oyster-related crossword that I trust you'll enjoy. And, for those still with questions about shucking oysters at home, check out his The Home Shucking News for the missing information you've been looking for. I hope you enjoy Richard's Oyster Information as much as we do. Let us know by posting a comment below.